True beauty may be inside, but the uncomfortable truth is that no one wants to touch a moldy cover even if there’s a good story in the pages. Dazzling first impressions are far more important than substance, not because the world is shallow (although it is) but because you can’t sell to someone who won’t walk in your front door. And in the blogging world, your front door is your blog title. You’ve made it past the click, so stay and examine the 5 reasons you clicked, 5 protips to get the most out of these strategies, and my own top secret bonus strategy that’ll help boost your online credibility. The number in the title is attractive for two major reasons: list posts are quick to read and easy to share, and the figure gives the headline reader an estimate of how deeply the topic will be explored. For example, you wouldn’t expect every bit of advice in 75 Tips to Land Prospects at a Trade Show: Hook, Line, and Sinker to have elaborate explanations, but you might expect greater detail from 5 Real Planets Way Weirder Than Anything in Science Fiction. Protip : go for an odd-numbered list. Outbrain, a “content discovery platform,” has done research to determine that odd-numbered lists have a 20% higher click-through rate. The word “reasons” promises specific content and lends itself to a feeling of completeness. A generic title will identify the topic, but qualifying the information assures the reader that you’re doing more than giving background to the topic; you’re providing a checklist of sorts that can outline options or procedures (e.g., 7 Hidden Warning Signs of Heart Disease, 9 Ways to Get Out of Bed with More Energy, 11 Places You Must Visit in Your 20’s). Protip : “Reasons” is a particularly powerful word to use in headlines. Marketing research often reveals patterns of behaviors, but the underlying causes for buying patterns are generally less explored. If you’re not onboard with a mainstream trend (e.g., specific color scheme or layout) but you can identify the underlying cause for the eventual benefit, you can still take advantage of the boost. The trend in marketing advice is to spend time on the “ About Us” section of your website and give your own narrative. However endearing and engaging these strategies may be, the bottom line is that your prospects are looking at your company to determine if your products or services can meet THEIR needs. By including “you” in the title, you’re demonstrating a focus on the reader’s needs while still highlighting your company’s role in helping them reach their goals. Protip : The “you” makes the tone conversational, so if you’re writing a whitepaper or hard research, an academic approach (no “you”) would be more appropriate for the audience and writing style. In the same vein as #2, the verbs “clicked” and “read” are powerful motivators. Not only do they emphasize a call to action, but they’re also subconsciously clueing your reader in that the content you’re offering isn’t fluff. Platitudes about doing what you love and sticking to your principles are great for Grandma’s cross-stitch, but actionable material closes deals. Plus, by including “clicked” in the past tense, you’re already presenting them your desired scenario: they’re going to click and find out more. Protip : Use variety in your action words, but make sure it doesn’t look like a 6th it just after discovering the Thesaurus tool. Make your verb the focus of the statement to be concise in your writing. Instead of “create a network,” try “network with established authorities.” If the article is more about identifying the best writers in your industry’s online presence rather than an instructive guide to networking, putting the strongest verb at the front will also best represent the content in your section heading. People like when others agree with them… almost as much as they love being contradicted. By giving a directive, you either motivate someone to comply (Hey, that sounds like a good idea!) or ruffle their feathers for a fight (Finish this article? I’ll show them I can just start it and then click away!). Lump these in with other popular headline tags like: “You don’t believe what happens next!” (I’m looked at you, Buzzfeed. ), and “What this 8 year old girl can do with nunchucks will blow your mind!” (Still you, Buzzfeed.). So now it’s time to pay up on my promise for the top secret strategy for boosting online credibility. I said earlier that first impressions are far more important than substance, and I stand by that. But if you’re going to get more than just the click – if you’re going to nail the sale – you need to follow through with credibility. The first impression is important for the initial contact with a prospect, of course, but also because it’s the first promise you make that person, and whether or not you seal the deal depends on if you deliver what your headline promises. The strategy : Write a blog post that meets the needs of your ideal clients, and write your headline to the broadest audience you can. 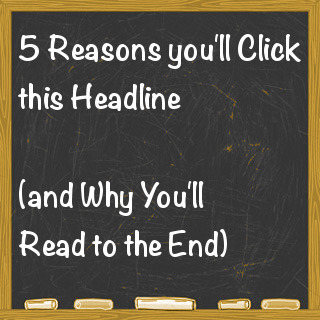 If your headline is so specialized it only gets 100 clicks and an extraordinarily generous 50% turn into sales, that’s nothing when compared to writing a sensational headline that gets 1000 clicks and gets a 10% close rate. Thanks for sticking with me until the end… just like I said you would.